When I saw the “recipe” for these, I decided I needed to try to make them because they looked so easy and delicious. Boy am I glad I did. They turned out super yummy and they are an easy enough recipe that even the boys are able to help me with making them. The other positive thing is that you only need three ingredients. The boys really like the M&M version. In fact, I needed to lock the deep freezer so that the Wee One wouldn’t get into them. I think these are his favorite of all the candies I’ve made. Line a cookie sheet with foil. Place whole pretzels on the foil in a straight line. Place a Rolo flat side down on the pretzel. Put in the oven at 350 degrees for about 4 minutes. 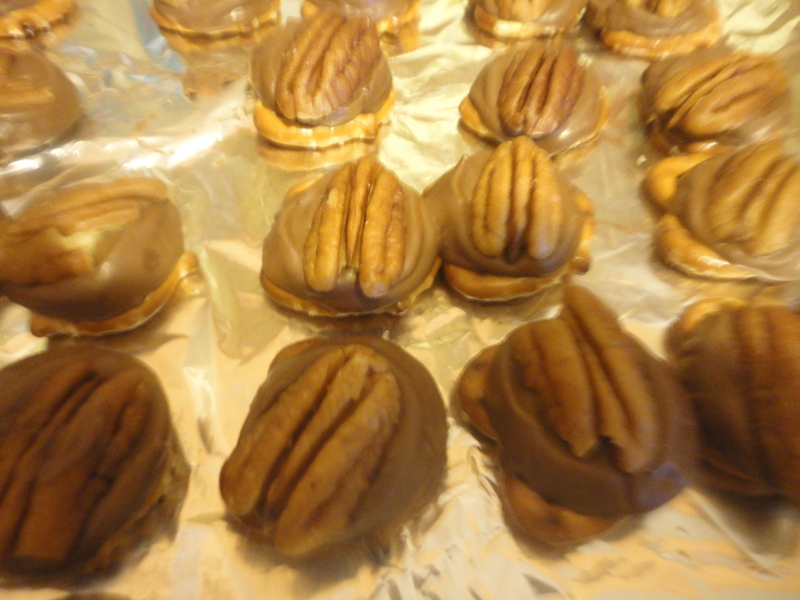 Carefully pull out of the oven and then place either a M&M or a pecan half on the top of the melted Rolo. Allow the turtle to cool and then place in a plastic bag and store. I froze mine and they did fine. Pingback: Christmas Baking « I'm Hungry!